It ran for 418 performances. The story opened with a prologue, in which Martin (the Yankee) is visiting his former fiancée, Alice Carter, on the eve of his marriage to Fay Morgan. Discovering them together, Fay knocks Martin out with a champagne bottle; while he is unconscious, Martin dreams he is back in Camelot in the days of King Arthur. He falls in love with Demoiselle Alisande Le Carteloise (a.k.a. Sandy), "a damosel who's as dumbas'ell - but sweet". Dubbed "Sir Boss", he is in put in charge to industrializing the country. 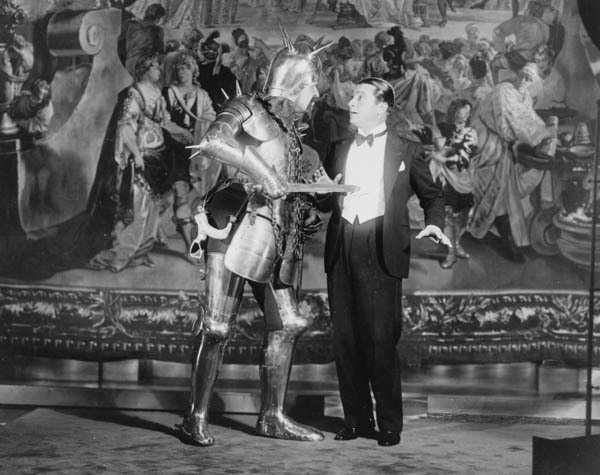 Working on a percentage basis, Sir Boss creates a one-man revolution by introducing telephones, advertising and radio to the astonished Knights of the Round Table. The King's evil sister Morgana Le Fay (a non-singing role in the original production), has Alisande Kidnapped, but Sir Boss rescues her just before awakening. Back in the present day, he realizes it is Alice not Fay, whom he really loves. The song My Heart Stood Still was originally written for One Dam Thing After Another and had to be bought back for $5000 to be put in A Connecticut Yankee. 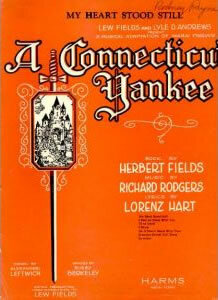 The song Thou Swell left the audience cold after the show opened in Philadelphia and after 3 weeks it still hadn't grown on anybody but Richard Rodgers insisted it be left in the show until it opened in New York, They never considered removing the song again.